I am not a geneticist. 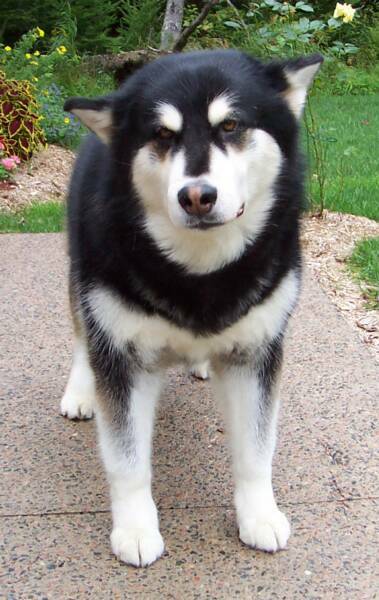 Instead I’m just a Malamute owner with a particular interest in this topic. I have bred small animals (rats, mice, and Syrian hamsters) for almost 20 years, and the practical experience gained through that medium has left me fascinated with coat color genetics. The information I am going to present here is not an in-depth discussion on the mechanics of color genetics. Instead it is intended as a basic overview, with the goal of de-mystifying the subject for those with little genetics background. Coat color genetics is not some magical system for predicting the color of animals, nor is it an elaborate mathematical equation which can only be solved by a brilliant scientist. 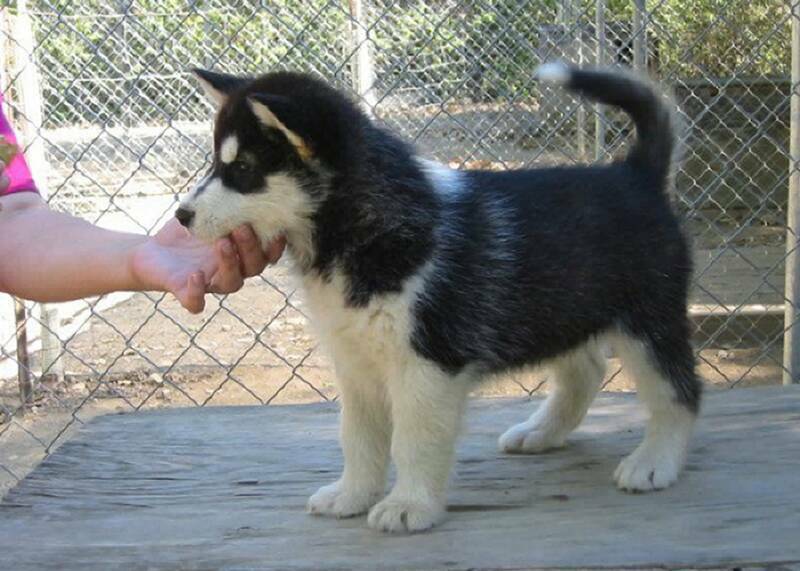 Instead it is a straightforward way of identifying why a dog is a particular color and determining how that color will be passed along to its offspring. density of these two pigments throughout a dog’s coat is what causes it to be a particular color. 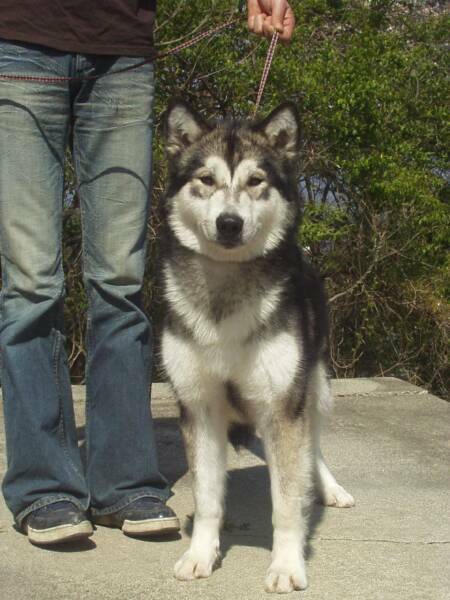 effect on the pigment in the coat, and all the loci taken together “spell out” what the dog will look like. others. 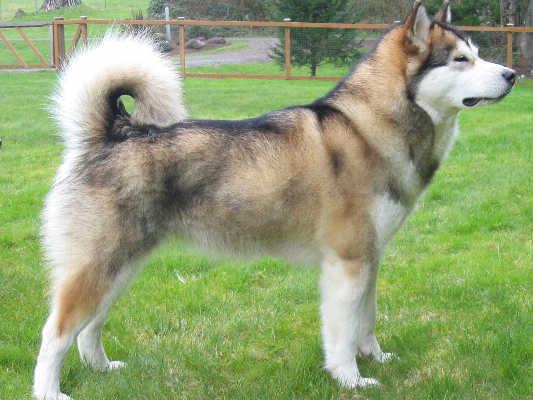 All of these factors, considered together, “spell out" what color the Malamute will be. The first two loci we are going to look at control how the two pigments (eumelanin and phaeomelanin) are distributed on each hair. 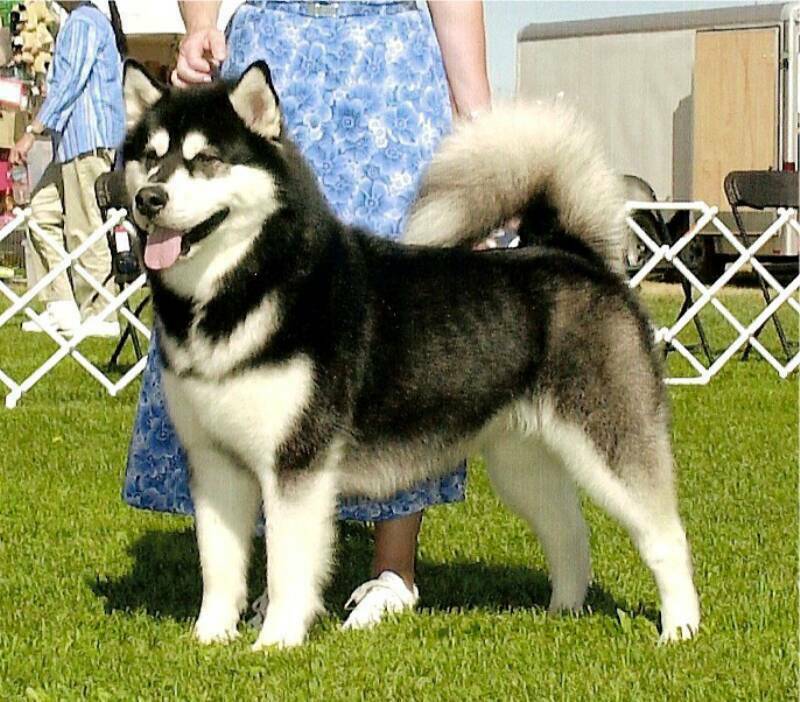 If you pluck a few guard hairs from a malamute’s coat at the shoulders (or just part the coat and take a close look) you will see that each guard hair contains a pattern of bands. 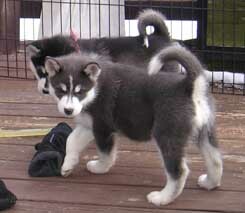 The exceptions, of course, are black and whites and solid whites where the guard hairs are all one color. 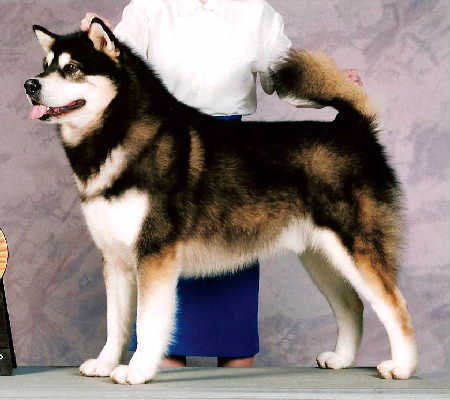 On a typical sable malamute you will see a black tip, a yellow/red band, a second black or gray band, and then light yellow/red down by the base of the hair. What you are seeing is a pattern of first eumelanin at the tip of the hair, then a band of phaeomelanin, then another of eumelanin, and a final band of phaeomelanin down near the skin. As you move down the sides of the body it becomes much more difficult to clearly detect all the various bands in the hair. 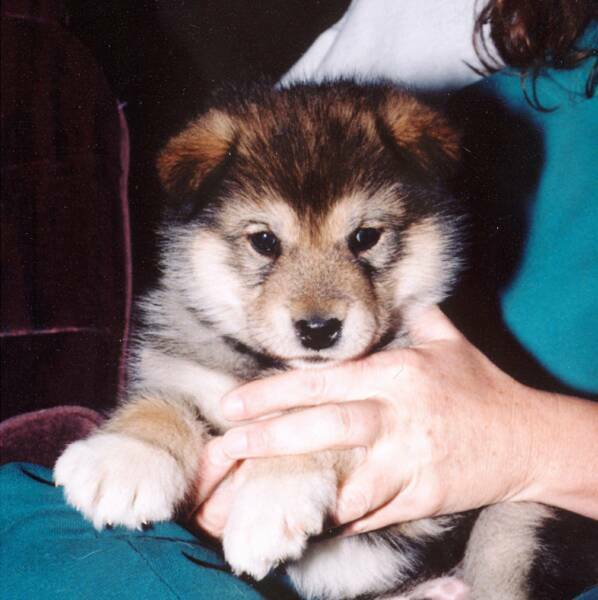 Banding in the coat of a Sable Malamute. Note the 4 different bands of color visable. exist. 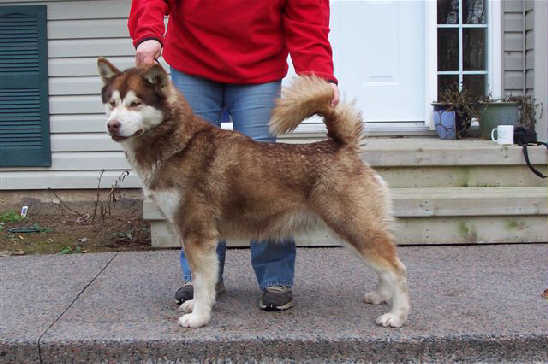 It appears that only two agouti alleles are found in Malamutes. 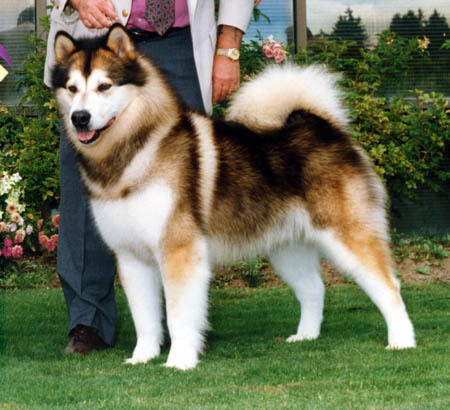 All Malamutes are either Agouti pattern or Tan Point pattern. 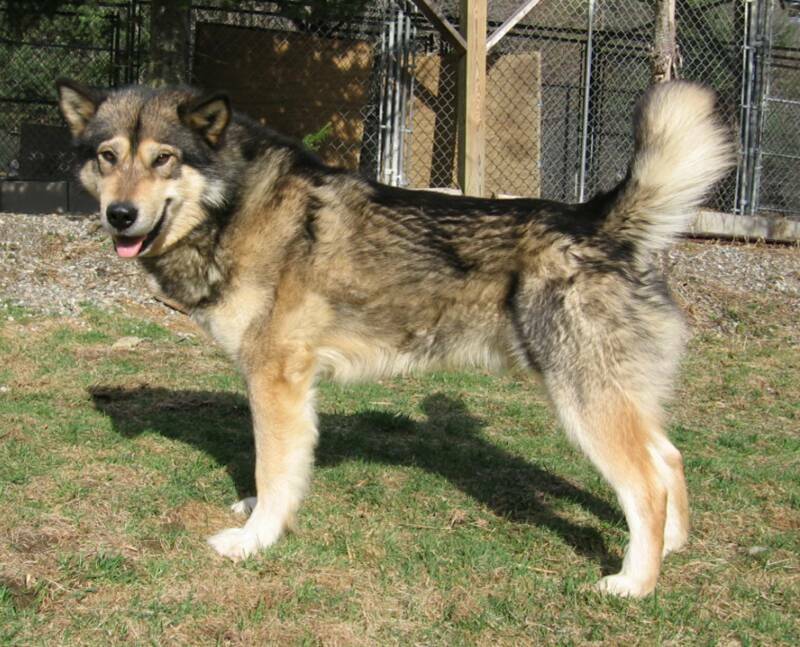 Also known as wolf pattern or wild pattern, this is very similar to the pattern seen in wolves. Other sources may use the letters aw or ag to represent Agouti. This allele produces a pattern of a black tip, a yellow band, a black band, and then a light yellow band at the base. 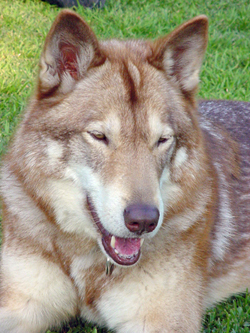 The Face does not usually have distinctive tan point markings, and instead of a clear “bar” on the top of the muzzle the color "bleeds" down around the face. otherwise create the "tan" legs and points, leaving these dogs black and white. 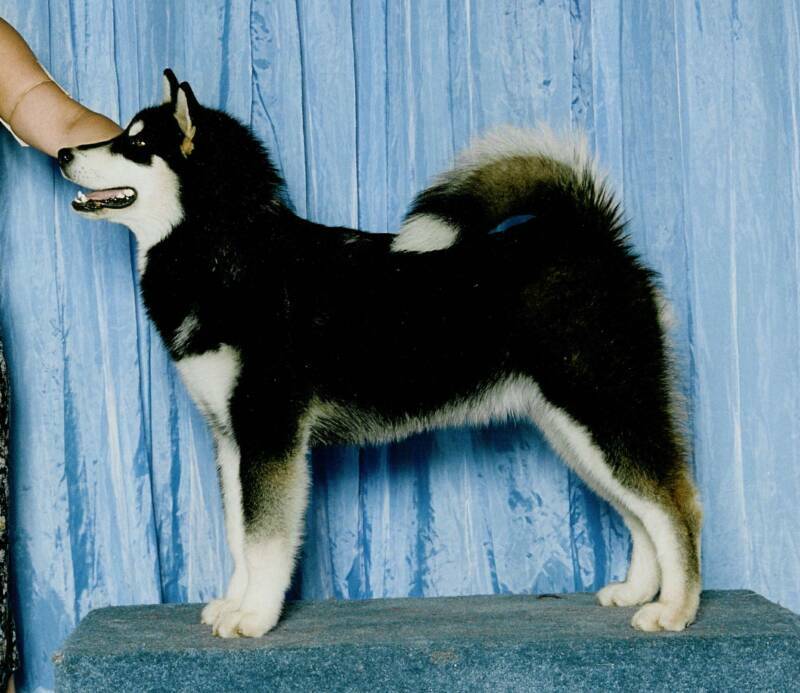 In its homozygous form, this allele produces solid colored black guard hair on the dorsal or top surface of the body. Essentially the black band at the tip of the hair extends to cover the entire hair. The undercoat is always solid black or gray. 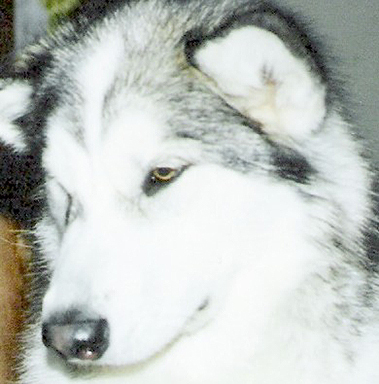 often still be seen as an increase in facial markings. 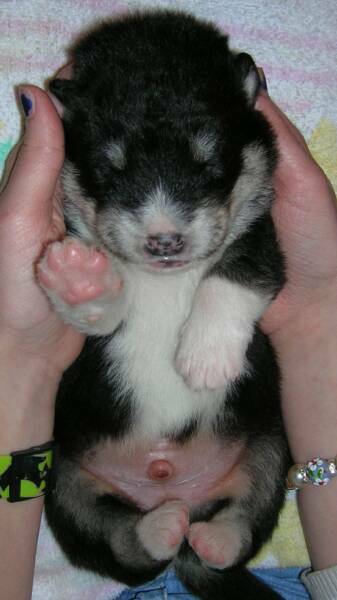 birth are a classic sign of Domino. Domino also extends the size of the phaeomelanin bands in the coat. In Agouti this eliminates most banding except along the topline, leaving just the dark eumelanin tip on an otherwise light hair, and giving an overall grizzled appearance. 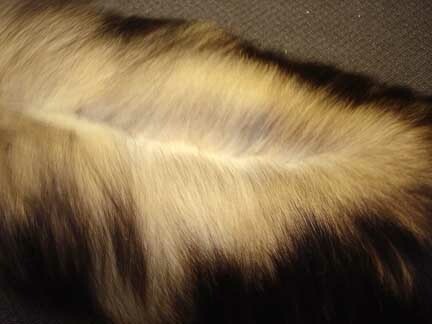 In Tan Point dogs, Domino produces a phaeomelanin band at the base of the hair. These dogs will appear to be Agouti or Tan Point as described above. Compare the "AA" Domino dog on the left and the "atat" Domino dog on the right with the non-Domino dogs pictured in the Agouti section. 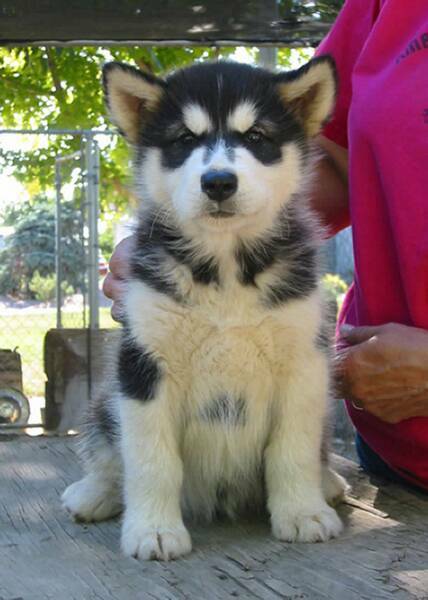 Note the crisp facial markings. 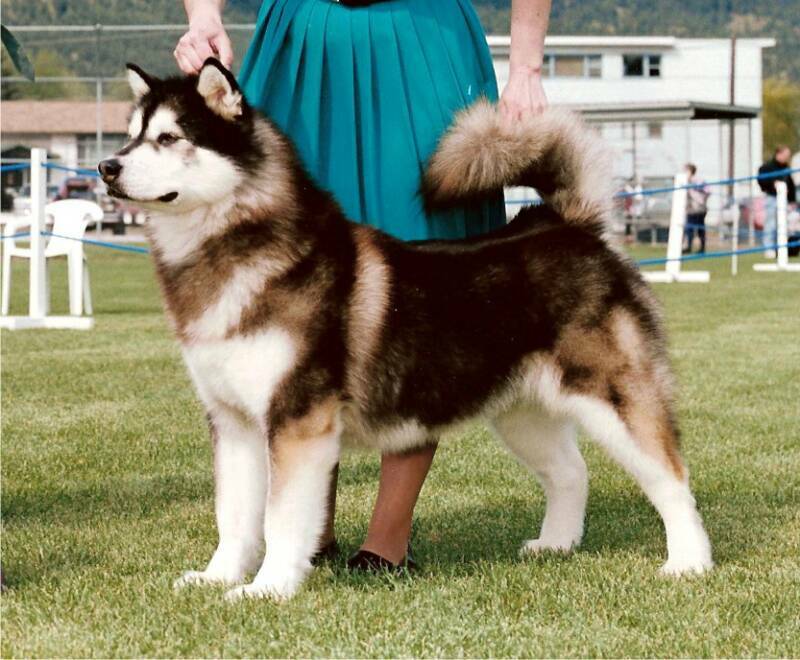 The rest of the loci in Malamutes deal with the density and appearance of each kind of pigment. They simply change the appearance of the pigment bands that have been determined by the Agouti and Domino loci. These pigment factors are NOT dominant or recessive to each other, or to the Agouti or Domino alleles. 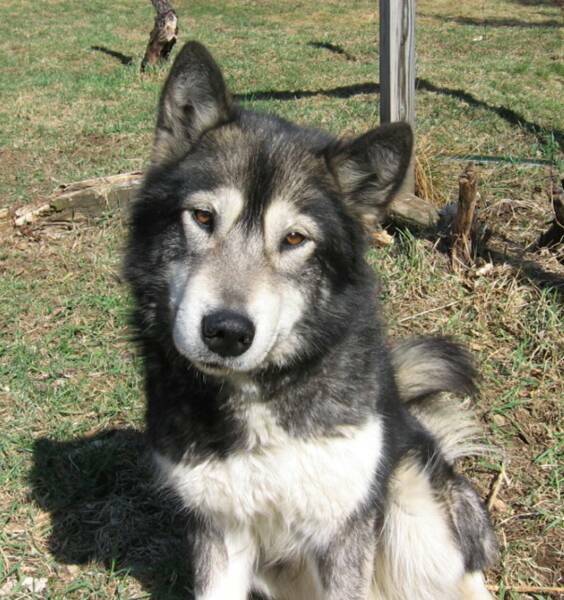 Instead each one operates independently and each one is present in every single dog. Traditionally the "C" or Chinchilla locus is responsible for turning phaeomelanin very pale in other species. 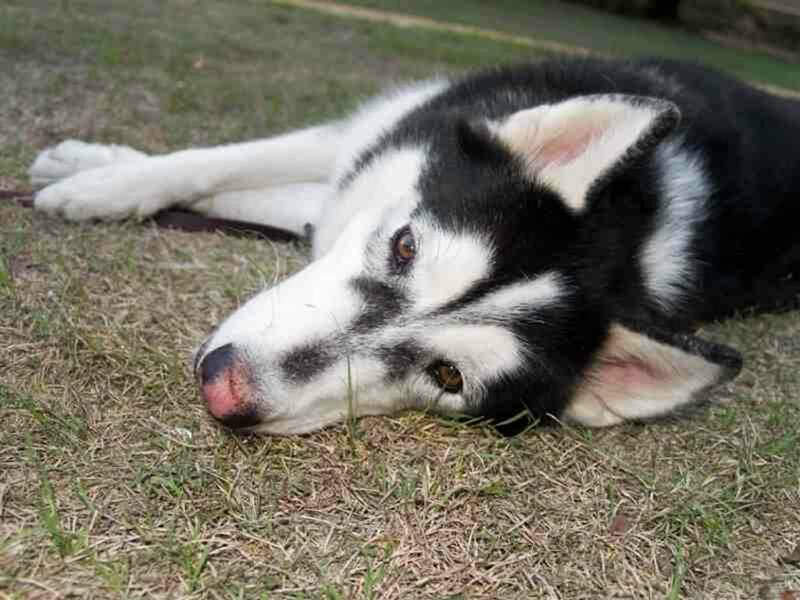 Thus far studies show that “C” is not the locus which has this effect in dogs. No one has determined what locus it is, however. Thus I'm using "Chinchilla-like" locus instead of just Chinchilla Locus. The recessive allele at this locus lightens/removes phaeomelanin pigment (the yellow/red band) wherever it appears in the dog’s coat. It does not affect the eumelanin (black/brown) pigment at all. It also has no effect on eye color or skin pigment so nose color remains black. This locus is responsible for changing Sable into Gray, and Dark Sable (or Seal Sable) into Seal. its tan pigment are also "Cl" or Sable. 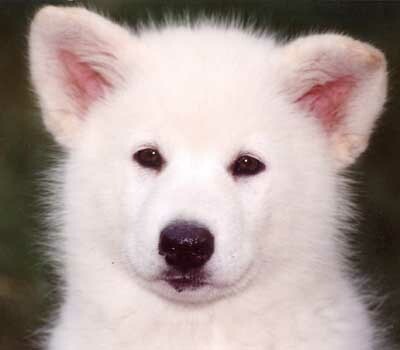 It is worth noting that genetically the term "Sable" is not correct for this color, and in other breeds Sable refers to another color all together. this pigment is not seen. 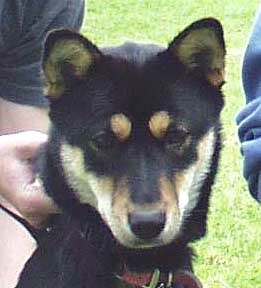 The recessive allele at this locus changes black (eumelanin) pigment to chocolate brown wherever it appears on the dog. It slightly lightens red/yellow (phaeomelanin) pigment. The black band is changed to dark slate gray. Pigment on nose, eye rims, lips, and pads is also changed to dark slate gray. Eye color is yellowish or hazel, sometimes with a gray or bluish cast. 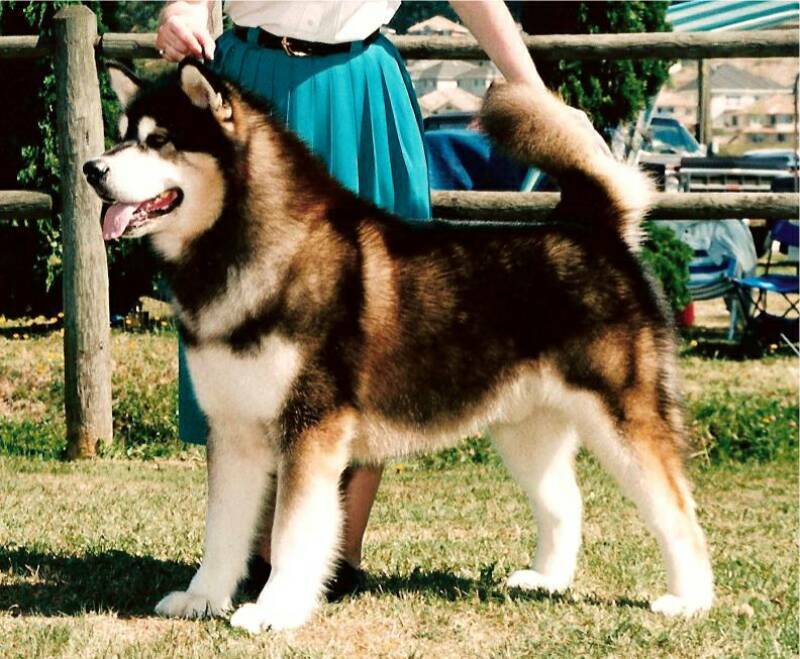 In addition to banding on the hair and color of pigment, white spotting is also present in Malamutes. There is often a lot of misunderstanding about what white spotting does and does not do. 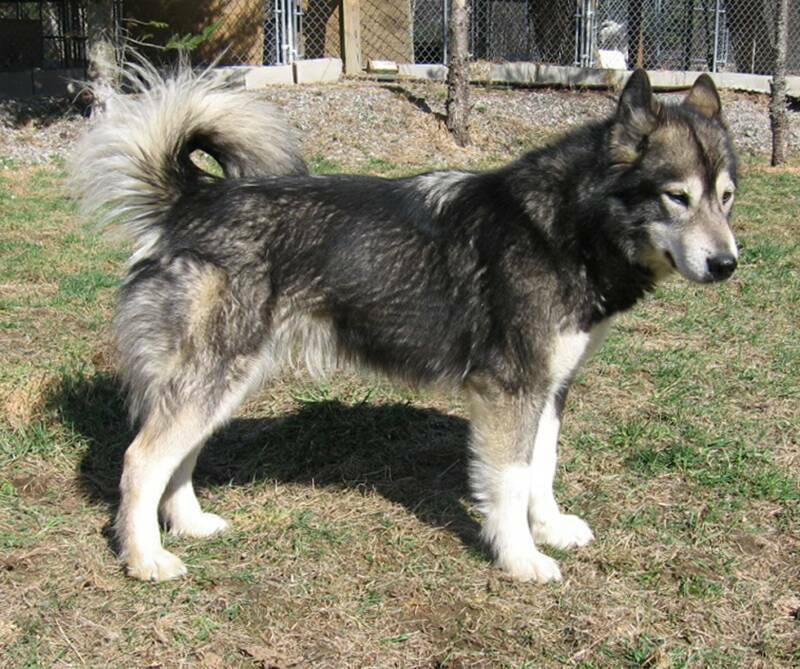 White spotting does NOT give us the white under-parts that are a trademark of Malamute color. That is instead caused by the Agouti and Domino loci, with some help from the Chinchilla-like locus. don’t see them) or are in areas joining those already white (so folks don’t realize they are being caused by something different). 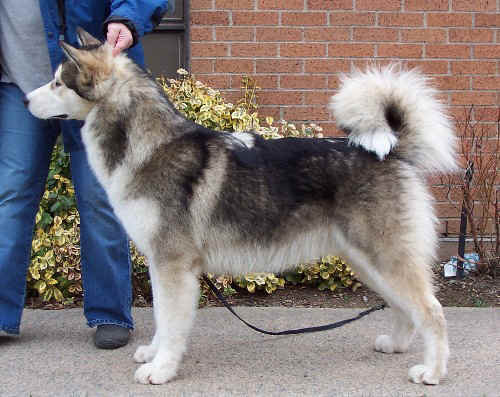 unusual for these dogs to have colored hairs running down the backs of their hocks, color bands that are unbroken or almost unbroken on their chest, and no white tail tip. The appearance and depth of color in the yellow/red phaeomelanin band in sable dogs is controled by modifiers and can vary greatly. 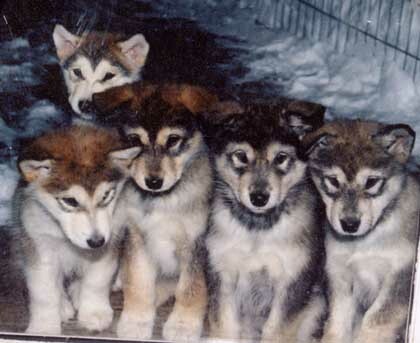 These dogs are all genetically Sable. Again note the distinct Agouti eyerings. Regardless of their adult appearance, Agouti pups always have a very characteristic sooty color. 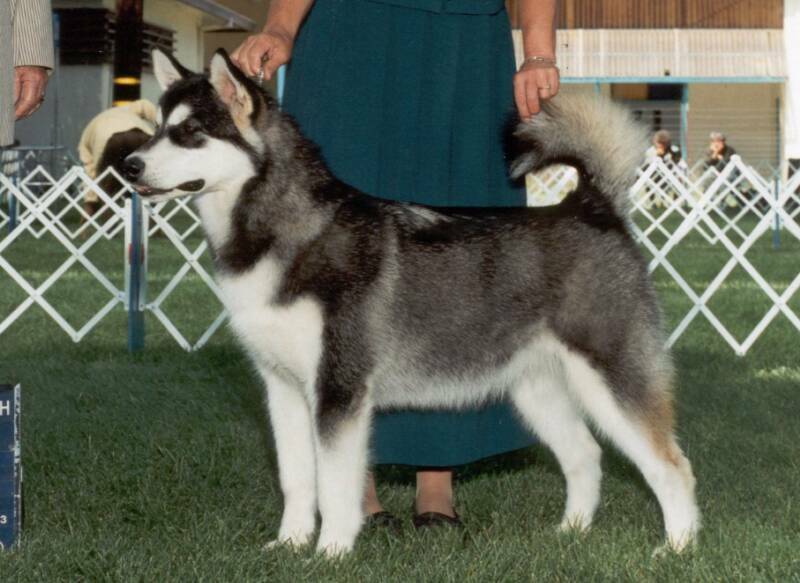 An interesting side note is that this gene is notorious for “failing” along the line where the top color meets the points – leaving sable “trimmings” where you can still see the yellow/red band in the dog’s coat. The recessive allele at this locus overpowers the banding that would otherwise be dictated by the Agouti locus and instead programs each hair to have only phaeomelanin (yellow/red) pigment from tip to base. As we have already discussed, Phaeomelanin is changed by the Chinchilla-like locus (cl), reducing this color to white or off white. The black/brown and yellow/red bands in the coat are unaffected. sometimes with pale yellow or red “points” usually seen at ears and dorsal stripe. 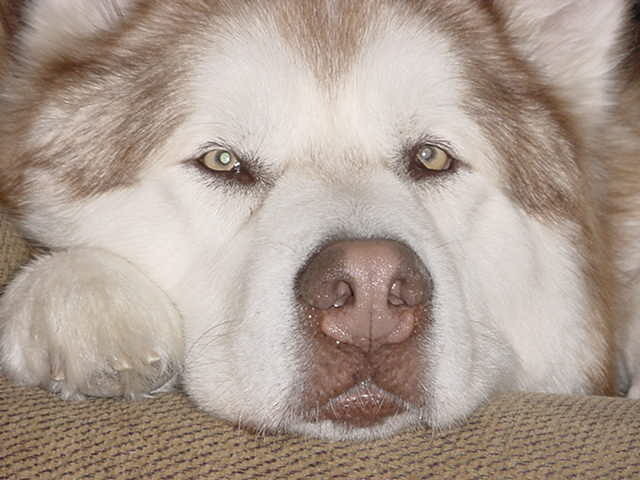 Pigment on the dog’s nose often fades to a pinkish color as the dog ages. Eye color and eye rims are not affected. a Blue "dd". This would be called a dilute red or more correctly "Lilac". Dilute will still turn black pigment gray, and brown will turn that gray pigment into "red". But the red will appear duller and less vibrant than in a non-dilute red. Red Sables. 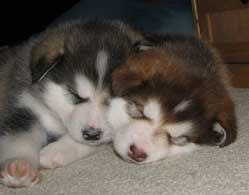 Phaeomelanin is visable in the faces of the pups on the left and in the undercoat of the dog on the right. Lilac (Red + Blue) on the left. 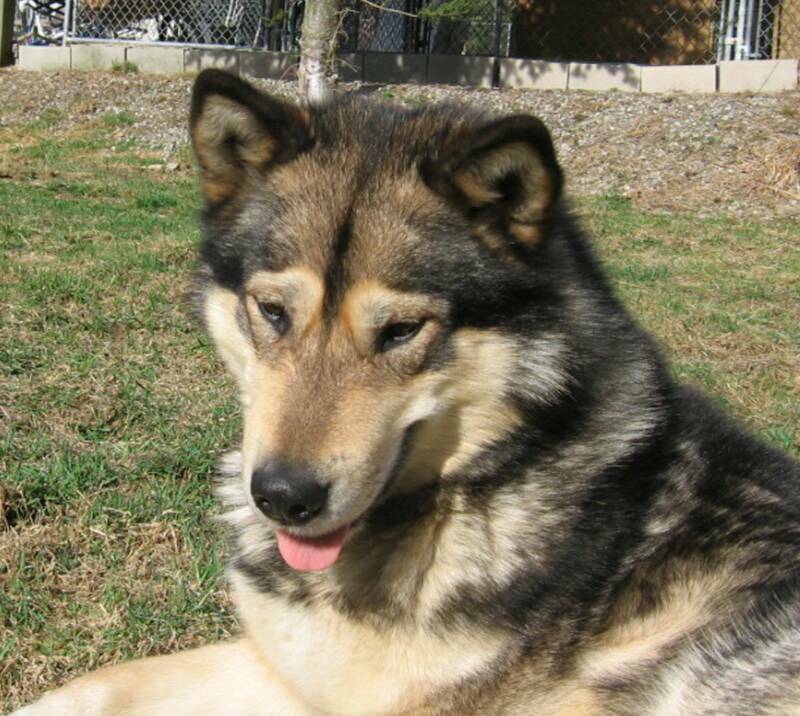 The color of this dog's pigment, particularly on the nose, is grayer and duller. The Red Sable on the right has pigment which is much more brown in appearance. 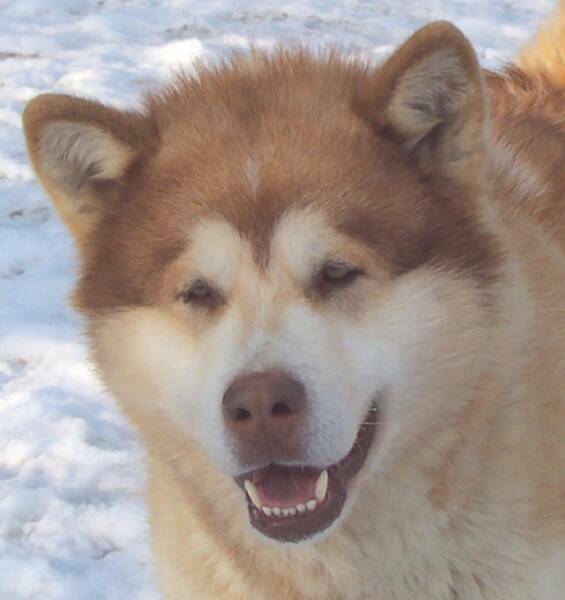 Putting it all together, every Malamute is a combination of all these factors. As I said at the beginning of this article, all these factors taken together “spell out” the color we see on a particular dog. And Midnight is a seal who carries White. As long as that explanation is, it's a very simplified version. There are also a number of other issues that could be discussed. Like modifiers that determine just how much of the hair tip is colored or the range of shades of color. Also not discussed are linkages like the one that appears to exist between Tan Point and Brown. I would encourage anyone interested to look further into this fascinating topic. A special thank you to Liisa Sarakontu. Without her willingness to share her knowledge, as well as her valuable comments and suggestions, this article would not have been possible. Bowling, Sue Ann. Animal Genetics. Sarakontu, Liisa. 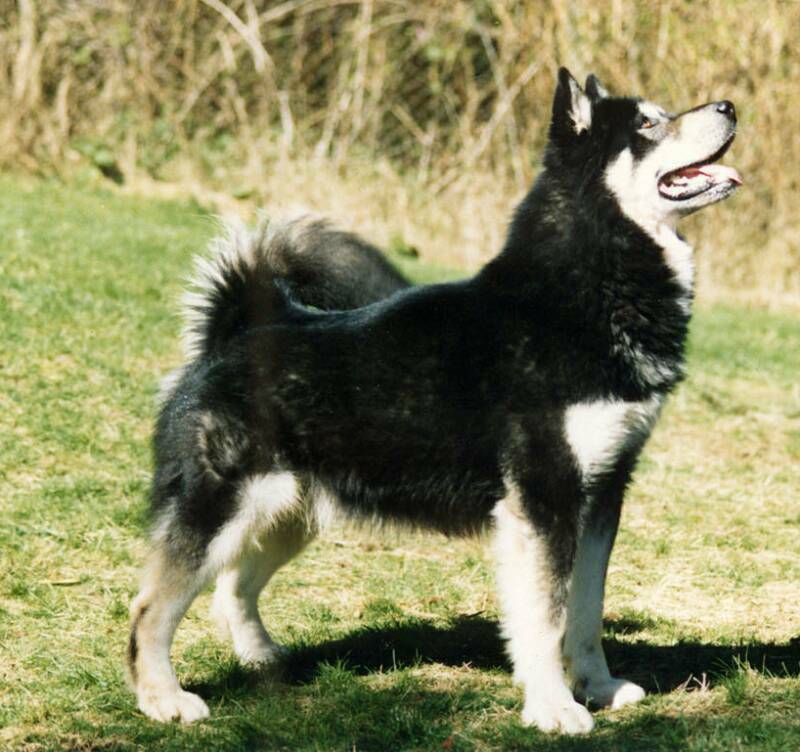 Koirien värejä - Canine Colors (Finnish Lapphund). Schmutz, Sheila. 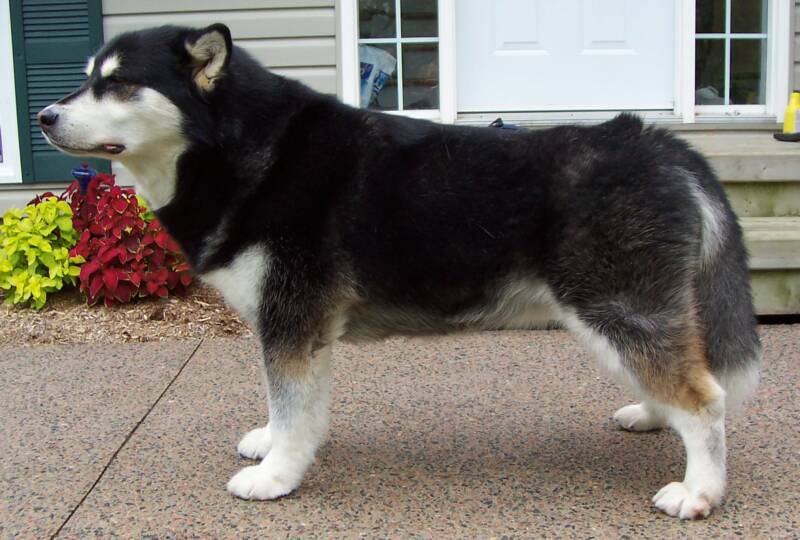 Genetics of Coat Color in Dogs. March 10, 2007. Silver, Lee M. Mouse Genetics - Concepts and Applications. Oxford University Press1995. My deepest gratitude to the following individuals who generously allowed me to reproduce photographs of their dogs for this article: Tina Robbins, Suz Richardson, Vicki Daitch, Michelle Frank, Cindy Neely, Bilinda Marshall, Lisa Kellar, Kathleen Corkum, Maurine Marcus, Bob Sturdivant, Sue Fuller, Phyllis Hamilton, Leesa Rhyde Thomas, Shilon Bedford, Judy Paule, Charlene LaBelle, and Dorothy Hood. 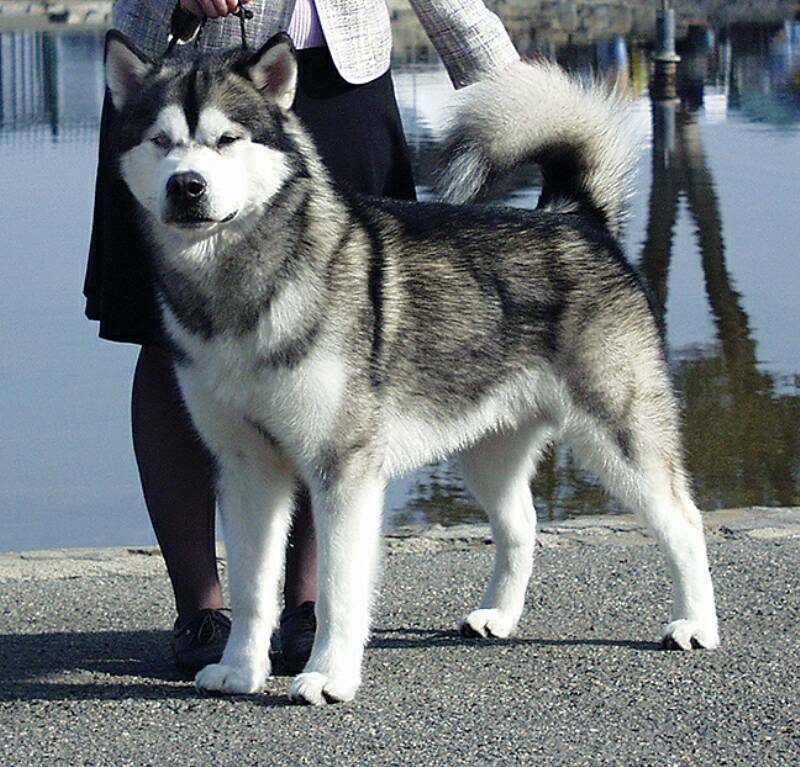 Malamutes who have larger amounts of white spotting are often Irish Spotted “sisi”. Irish Spotting confines white spotting to the legs, end of the tail, chest, underbody, face, and neck. The white spotting does not cross the dogs back between their neck and tail. In Malamutes we have come up with a variety of names for the different places and ways Irish Spotting can express itself. 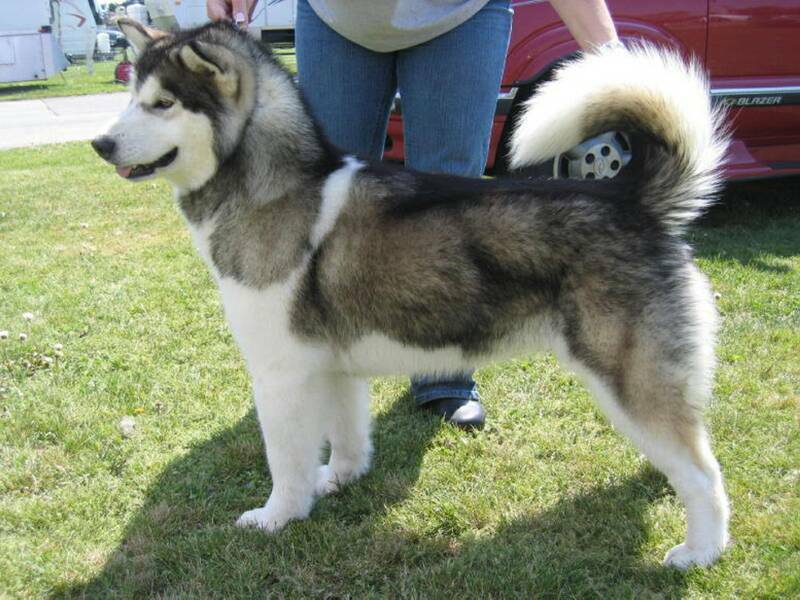 Blazes, stars, split bars, eagle markings on the chest, white collars, nape or wither spots, and white tail tips as well as the variety of “mismarkings” that are occasionally seen are all usually caused by Irish Spotting. Like the Agouti locus, incomplete dominance is often seen in white spotting. Dogs who are heterozygous “Ssi” frequently have more white than “SS” dogs, but less than “sisi” dogs. belly towards the back. This would produce the broken color or uneven splashing that is listed as undesirable in the standard. 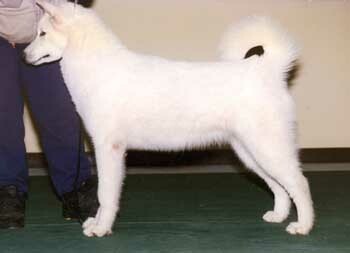 This characteristic has been heavily selected against in the breed. 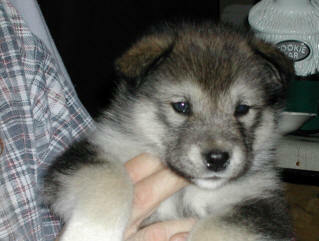 Tan Point pups lack the clear cut facial markings seen in Seal pups. 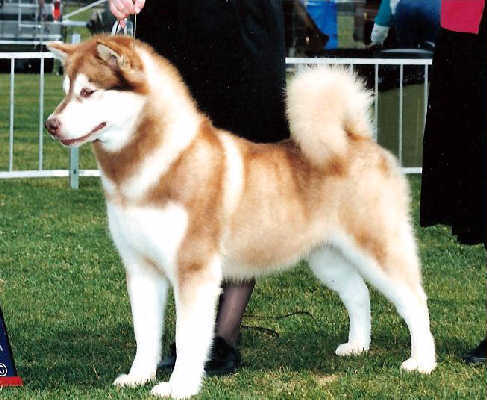 Red can be found in any of the patterns seen in malamutes. 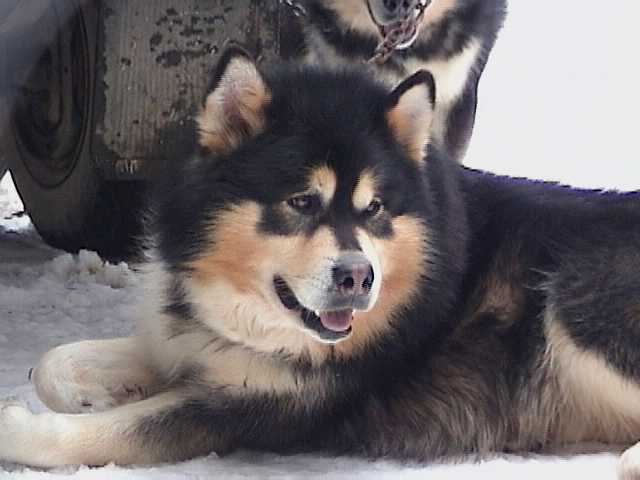 As adults these dogs can resemble seals or grays due to other factors affecting their coat color, and it is not really unusual for some to develop more standard facial markings. 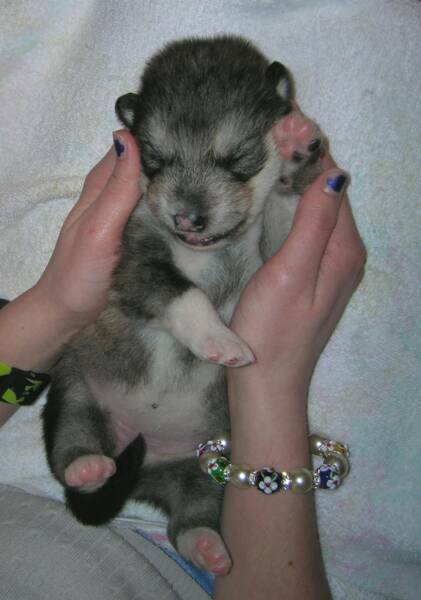 As puppies their dark and sooty facial markings are a clear giveaway that they are agouti. Adult Agoutis often appear to have a light ring around their eyes when looked at head on, and this can be a tip that an otherwise gray or seal (or sable) appearing dog is actually an agouti. 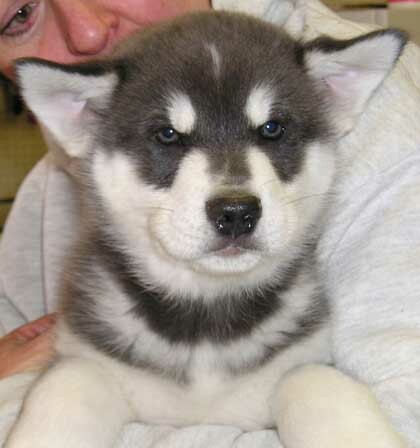 Though clearly an Agouti as a pup, this dog's adult appearance could easily be mistaken for gray. 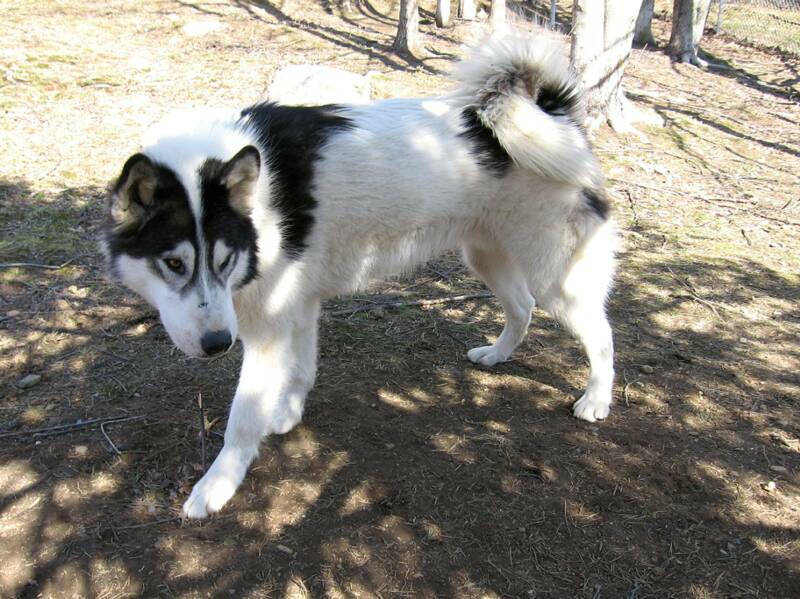 Dogs that are homozygous for recessive Domino will have crisp clean facial markings from birth and an increase in the phaeomelanin band at the base of their coat. 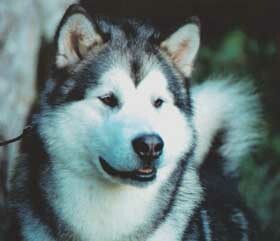 The vast majority of Malamutes are Domino. Domino turns Agouti into Sable or Gray and turns Tan Point into Seal. 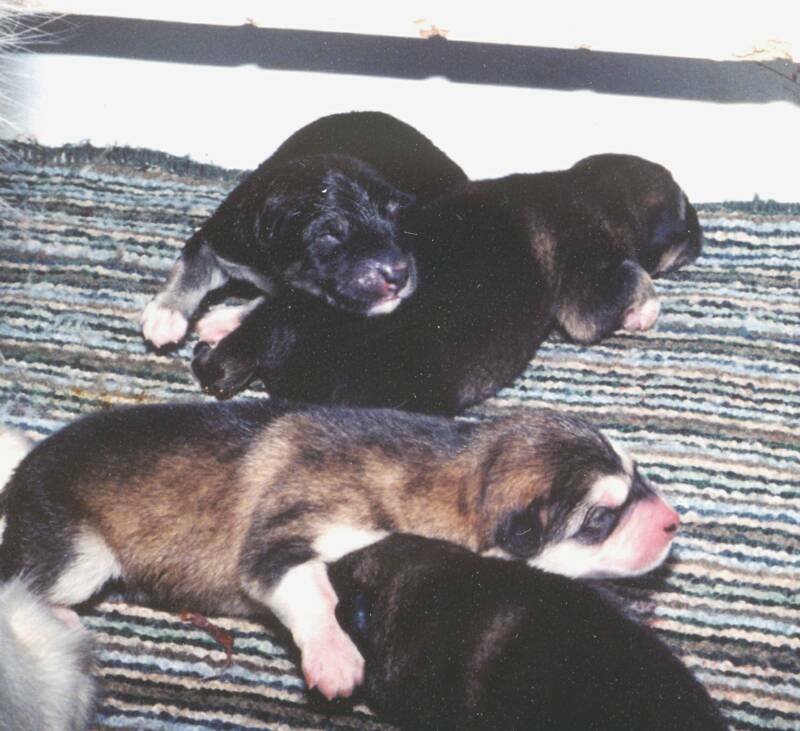 The black band in these dogs is changed to chocolate brown. Pigment on nose, eye rims, lips, and pads is also changed to a chocolate brown. Eye color is usually lightened. We call these Reds. Agouti or Domino Agouti reds are usually just called "red". Tan Point or Seal reds are frequently referred to as Mahogany Red or Dark Red. 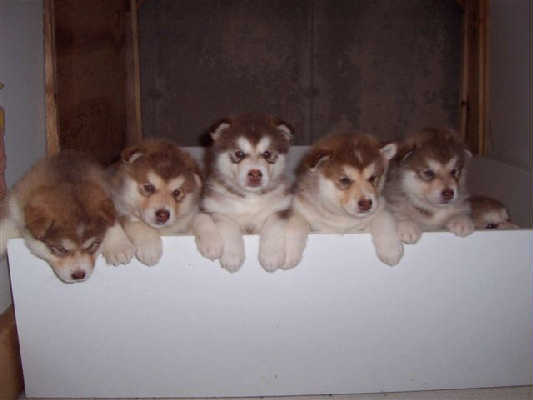 These Malamutes are all solid colored. They have unbroken color on their chests, color extending down their legs, and little or no white on the tip of their tail. The dogs in the front are blue. 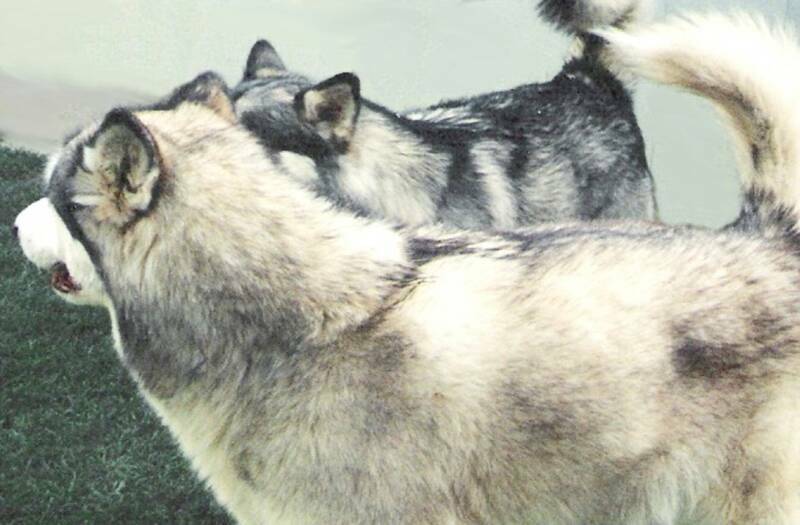 Compared to the dark gray (left) and Seal (right) in the rear, you can see the blue's coat color appears paler and slightly washed out. The Brown locus changes black pigment to brown. The difference is clear in the two littermates. 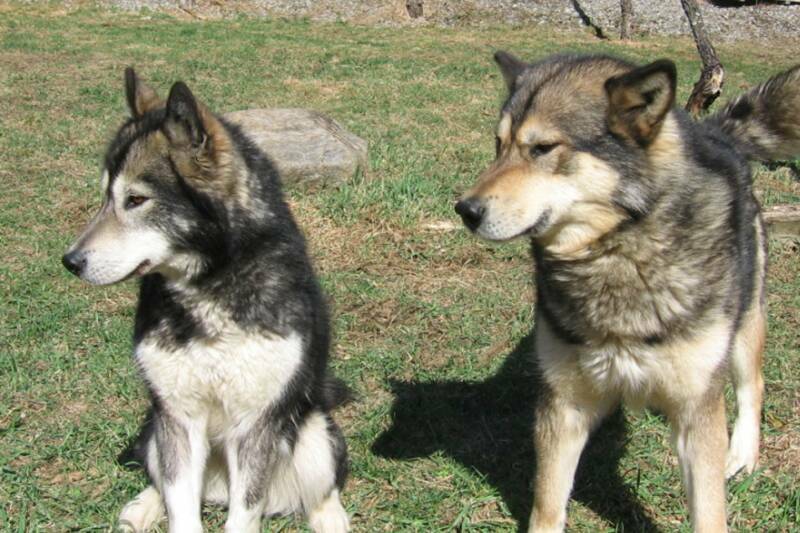 Note not just their coat color, but also their noses. You can see the slightly washed out pigment on the noses and eye rims of these two Blues, as well as the yellowish or hazel eyes. Pigment on the pads is also affected by the dilute locus (right).